Jacket, Enlisted Men's, Flight, Type B-14. By W & C Clothing Co. Size 36. 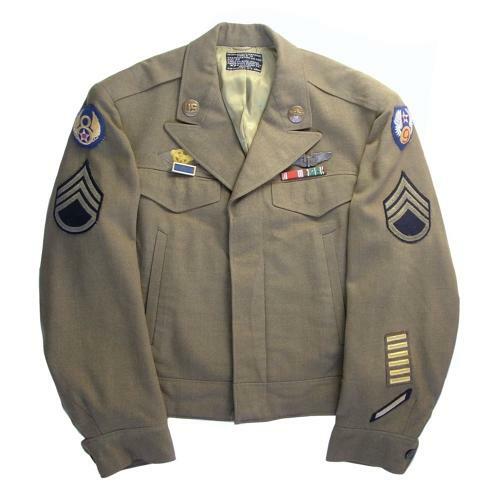 This is technically a flight jacket but basically an 'Ike' type jacket that actually preceeded the introduction of the 'Ike' and was unique to the Army Air Force. Standardized for use by enlisted aircrewmen in March 1944. Similar in appearance to an 'Ike' and manufactured in olive drab wool (Shade No.54). It has concealed breast pockets (with exposed flaps) and midriff slash pockets. This example has superb English made 8th and 9th AAF shoulder patches that have been stitched in place with light padding to the rear. There is a 'Sterling' marked clutch backed airgunner wing, screw backed collar insignia, staff sergeant. 3rd grade stripes, 6 overseas stripes, 1 wound stripe, distinguished unit citation badge, ruptured duck discharge patch and ribbons for Army Good Conduct and ETO (4 stars - 2 missing!) medals. Fully labelled and AAF marked. Overall condition is very good although it is a little faded and there are a few very small moth holes. These jackets are now extremely rare to find. Don't miss this super example originally sold by us 10 years ago! Stock code U23423.